A practical guide to laboratory diagnosis and treatment of hemostatic disorders. This concise book distils the most clinically up-to-date information on thrombotic and bleeding disorders, including the latest treatment strategies, for key conditions and diseases. 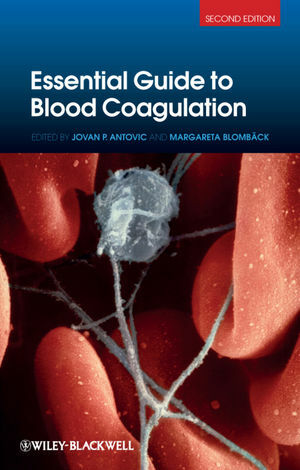 Essential Guide to Blood Coagulation covers both the stable and the acute stages of hereditary and acquired bleeding and thrombotic disorders. Faced with a bleeding patient, it may be difficult to determine whether blood loss is due to a local factor, or an underlying hemostatic defect. There are a range of laboratory tests which can be performed to identify the cause of bleeding in a patient. This book highlights the tests that can be used in the laboratory to aid diagnosis. Essential Guide to Blood Coagulation has been updated to include the new anticoagulants and now has a dedicated chapter on antiplatelet drugs. This invaluable guide will help all those treating patients to expand their knowledge of hemostatic disorders.